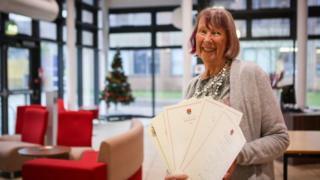 An 85-year-old woman has been awarded a PhD - her fifth degree - 36 years after she first graduated. Dr Anne Latto picked up the doctorate in storytelling at a ceremony at the University of Reading. She completed her undergraduate studies in film and drama at the same institution in 1981, achieving a 2:1. The university said Dr Latto, who also boasts a masters degrees in cognitive evolution among her collection, had a "formidable CV". The former drama teacher, from Emmer Green, Reading, added: "I didn't set out to do five degrees, but film and drama has been at the heart of my work all my life." Dr Latto said she would urge anybody considering doing a degree to "go for it" whatever their age. She said she would not be asking people to call her doctor, and added: "I'm much prouder of my five grandchildren." A university spokesman said Dr Latto celebrated her latest qualification with tea and cakes after the ceremony on Thursday.